The Centers for Medicare & Medicaid Services (CMS) just released a controversial and important new report: Medicare Part D – Direct and Indirect Remuneration (DIR). 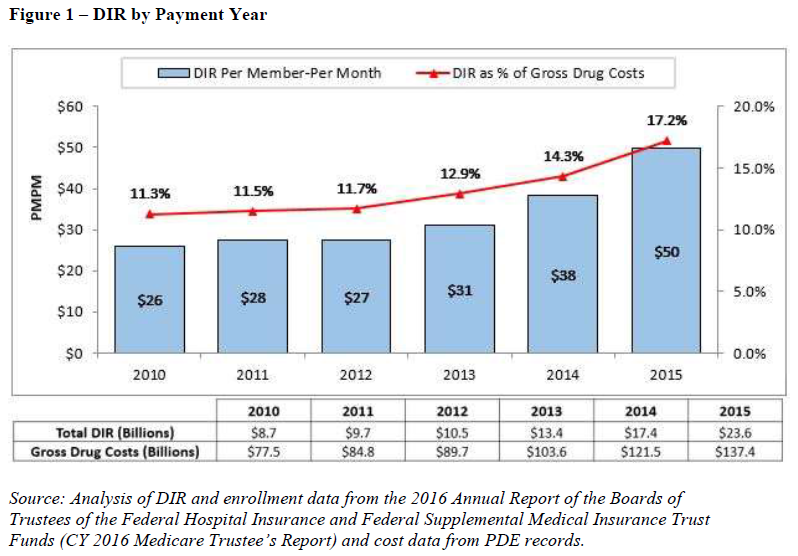 The report shows mixed consequences of DIRs in the Medicare Part D program. For example, manufacturer rebates (the biggest part of DIRs) reduce plan costs and Part D premiums. However, beneficiaries pay higher out-of-pockets costs because coinsurance amounts are based on the undiscounted, pre-rebate retail price. Meanwhile, the government is paying a growing share of drug costs due to catastrophic coverage. The CMS report has important implications for how we think about rebates, gross-to-net discounts, plan premiums, and patients’ out-of-pocket expenses. That’s why industry reactions have ranged from outrage to defensiveness. I encourage you to read the report and think about how it lays the groundwork for changing the Medicare Part D program. Direct and indirect Remuneration (DIR) is a broad term that encompasses various types of payments made to a part D sponsor. 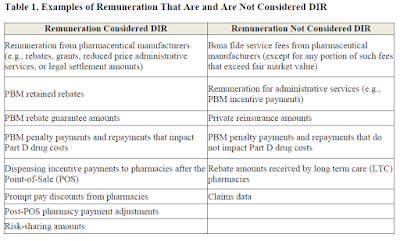 See the background in Behind Diplomat Pharmacy’s Plunge: A Primer on DIR Fees in Medicare Part D.
Here’s a CMS summary that provides examples of remuneration that are and are not considered DIR. 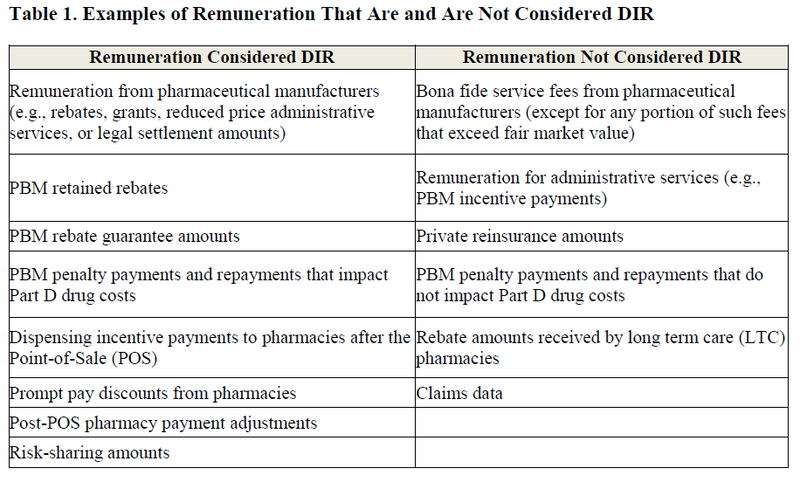 The table comes from Final Medicare Part D DIR Reporting Requirements for 2015. Here’s Figure 1 from the CMS report. It shows that DIR fees have been growing quickly. We can compare the data in this chart with Manufacturer Rebate Summary Report for 2014, which CMS published last year. The rebate report showed that total brand-name rebates were $16.3 billion in 2014. From the new report, we learned that DIR fees were $17.4 billion in 2014. By combining the reports, it appears that brand-name rebates were 94% (= $16.3 / $17.4) of total DIR fees in 2014. All other types of DIR fees shown in the table above totaled $1.1 billion (= $17.4 - $16.3). This figure would include “Post-POS pharmacy payment adjustments,” which are the per-prescription DIR fees that are pharmacies pay to Part D plans. 1) Some beneficiaries face much higher out-of-pocket costs. DIRs create a gap between list and net prices. Medicare beneficiaries whose plans have coinsurance feel the impact of high list prices. The PBM and plans can still collect a rebate, but these amounts are not reflected in the retail price. Thus, the CMS report expands on a well-known implication of the gross-to-net bubble, per EpiPen, Channel Economics, and the Great PBM Rebate Debate. 2) Medicare liabilities are growing, while plan liabilities are shrinking. DIRs grow along with the gross-to net gap. More beneficiaries get pushed beyond the catastrophic coverage limit, which is $8,071 in estimated drug costs for 2017. That’s equivalent to about two specialty drug prescriptions. Medicare covers 80% of the cost in the catastrophic phase, while plan liability is limited. 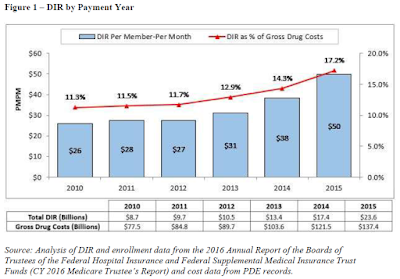 For more on Medicare’s growing liabilities, see the recent Office of Inspector General (OIG) report High-Price Drugs Are Increasing Federal Payments For Medicare Part D Catastrophic Coverage. 3) Plan premiums have been stable. DIRs are factored into the computation of beneficiary premiums. The growth in DIR payments has therefore helped to keep premiums from rising, though Medicare’s liabilities are growing due to catastrophic coverage. Express Scripts published Adding Facts to a Fact Sheet, which emphasizes the impact of DIR fees on net program costs. Express Scripts states that “as drug prices went up, member premiums went down.” The Pharmaceutical Care Management Association (PCMA) statement also focused on premiums, stating: “CMS’s report highlights how DIR reduces premiums for Medicare Part D beneficiaries, which leads to lower costs for the federal government.” (source) Both statements are true, but incomplete. But as I note above, almost all DIR fees are rebates. Even if all of the $1.1 billion non-rebate DIR fees were the hated “post-POS pharmacy payment adjustments,” the impact on pharmacy economics would have been surprisingly small. For 2014, I estimate that these non-rebate DIR fees would equate to 0.3% of pharmacies’ total prescription revenues and 1.4 % of pharmacies’ total prescription gross profits. These percentages represent the upper bound for these amounts. The actual impact was likely lower once the other types of DIR fees included in the $1.1 billion figure are deducted. The impact may have been higher in 2016. Consider Diplomat Pharmacy, which reported an unexpectedly large impact from DIR fees. For the first nine months of 2016, it recognized $10.1 million in DIR fees. (See Slide 4 from its November slide deck.) These fees equated to 0.3% of Diplomat’s revenues and 4.2% of its gross profit. I’ll have more to say about DIR and pharmacy economics in our forthcoming 2017 Economic Report on U.S. Pharmacies and Pharmacy Benefit Managers. Not to be outdone by the industry reaction, notorious short seller Citron Research used the CMS report to launch all-out attack on Express Scripts in Rebate System is a Financial Engineering Kickback Scheme. You may recall Citron as the firm that first alerted the world to the Philidor-Valeant relationship. Citron’s attack is predictably over the top. It’s worth checking out just to see how a dry government report can be used in an attempt to drive down a company’s stock price. Warning: reading the Citron report will definitely make you feel dirgeful.